p.s love the cheese/chicken/pasta combo – can’t go wrong! I have made this three or four times now and I can’t get enough! This has become my new what-to-make-when-having-people-over-for-dinner recipe and everyone loves it! I used white cheddar, and I leave off the gorganzola but add extra cheddar/monterrey jack to the top instead. YUM! Pingback: Useless Tendencies | Stylish, Stealthy & Healthy. I am making this again today for the second time and it just keeps getting better every time! Thanks!! I mad this the other day, great recipe, but you should add broil the pasta for a few minutes on the end to make the bread crumbs crunchy, I did not do that and they had no effect. Yep to both accounts! Skim milk is extremely thin so it is really hard to thicken. I would not use sour cream and would just buy 2% or whole milk for the pasta. In my experience, sour cream can sometimes separate and almost look curdled when added to a sauce. And as for the cheese – the shredded bagged stuff is convenient but nothing melts like freshly grated cheese. It’s all I use anymore! Any chance you can make any of this ahead of time? I want to make it for guests I’m having over after work next week, but don’t want to keep them waiting hours for dinner! I made this last night and it was amazing!!! I followed the recipe exactly as written. Thank you so much, Jessica!!! Made this last night for my sunday night dinner group and it turned out SO yummy! I used whole wheat organic rotini, skim milk, and reduced fat cheddar cheese (couldnt find reduced fat monetery) and it definitely didn’t taste like I had cut any corners. I’m very big on taking comfort foods like these and doing what I can do to make them as healthy as possible without skimping on the taste … everyone LOVED this dish and I will be making it again! Have you ever created some kind of combination of this and the Beer Mac & Cheese? How would one go about trying that? Everything I’ve ever made from your recipes has been a huge hit. Thanks for the street cred! Just made this today–it ruled! I’m going to have to make it again soon because I took it to a Superbowl party and there were not nearly enough leftovers. OMG so awesome, it combined all my fave flavors. Thank you!! I made this for the first time tonight, and it was delicious. I think the only change I’d make is to make more sauce next time; the pasta was a bit dry and I’m sure reheating will exacerbate the problem. I’d probably do at least 2 cups of milk and increase all the other ingredients accordingly. Like a previous commenter, my sauce never really thickened, and I was using 2% milk and freshly shredded cheese. Once I mixed it with the starchy pasta and the chicken, though, it coated nicely and wasn’t an issue. Similar cheese sauce recipes I have call for at least twice that amount of roux… but like I said it worked out OK in the end. My son is on the hs wrestling team and twice a week we have to take potluck for our hard working boys. Do you think this can be converted to a crockpot recipe? I’main absolutely certain the boys will love this. hmmm I’m honestly not sure – it would just be quicker to make it in the oven? If you put it in the crockpot you’d have to cook the chicken first – you’d still have to cook the pasta on the stovetop, and I’m not sure how the cheese sauce would come together in the crockpot, so you’d have to do that on the stovetop too! 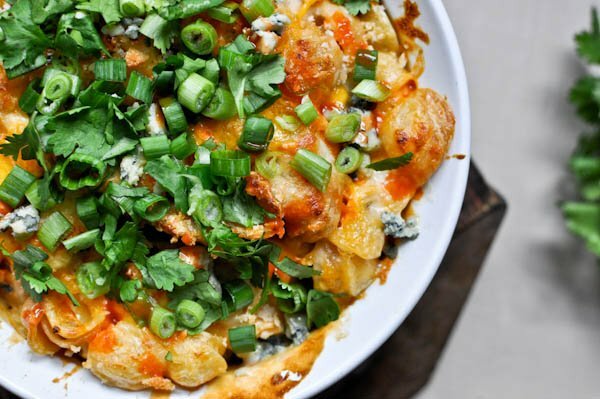 I am not a huge fan of buffalo-flavored things, but this mac and cheese is awesome! It gets better every time I make it. I just started adding garlic pepper and it was the best ever. Thanks for the great recipe! I shared it on my own blog! I just made this for dinner last night and it was delicious. However, my sauce never thickened. According to the recipe, the milk was supposed to thicken after adding to the roux. What could I have done wrong? I used 2% milk and regular (not light) cheeses. This recipe is great! Great flavor and I used left over chicken so it super easy! Awesome!! The difference between mac and cheese and “baked pasta” is that mac and cheese does not have meat in it. The addition of meat technically makes it a casserole. I learned this distinction from watching a video on the food network’s website on the topic a while back. Was that necessary to leave a comment about? The author explicitly asked someone to distinguish between macaroni and cheese and “baked pasta”, so yes, gene’s comment was necessary. Great Meal! Had difficulty thickening the milk but it turned out fine anyways and I added a clove of minced garlic into my sauce ! very heavy and can feed probably 8 people. Sounds great! I’ll have to try this sometime when it’s my turn to cook dinner for my roommates! What kind of buffalo wing sauce did you use? We tried this tonight.I was very disappointed.I had a hard time getting the milk to thicken.A lot of work for mac and cheese.My family did eat it and liked it but not enough to make again. Maybe I did something wrong…??? ?Maybe I needed more cheese. I couldn’t get the milk to thicken either. I think the proportions of the recipe are off. The proportions aren’t off, you just need to bring the butter/flour roux and mild to a boil. It will thicken almost immediately. I made this and it was wonderful. Even my 18 month old couldn’t get enough. Your not alone cause i am not familaur with any bands haveing to do with sweaters or poneys eaither! I betcha they arent even worth listening to. However this buffalo chicken with pasta and oodles and oodels of cheese is what i’m talkin about… ITS THE BOMB! I think your milk did not thicken because there is no mention of adding the flour to the milk. A tablespoon of flour is noted in the ingredients, but is not mentioned in the assembly instructions. No, it definitely is written in the instructions. Right after the butter melts.